In group discussions, we sometimes use facilitators to manage the flow of contributions. One technique employs a queue. During the discussion, usually while one participant is speaking, another might catch the attention of the facilitator to request a spot in the queue. In person, this can be done with a raised hand or a facial expression. In teleconferences, it might occur through a "hand-raise" channel or through texting. A single-strand knot. This particular knot cannot be un-knotted without cutting the string and rejoining it. 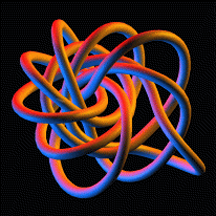 In this respect, it is similar to the kind of tangles that occur in multi-threaded discussions. But it differs from them in at least two ways. First, multi-threaded discussions consist of more than one strand. Second, since some contributions to multi-threaded discussions belong to more than one thread, the threads of discussions are sometimes joined to each other at one or more points. Untangling a discussion is thus a much more complex problem than unknotting strings. Image by Robert G. Scharein courtesy U.S. National Science Foundation. Queues work well for smaller groups discussing non-controversial topics. But when the energy level rises, or the headcount passes a dozen or so, disorder sometimes appears in the form of thread tangling. A "thread" in a discussion is a collection of related contributions. In most discussions, although all contributions are related, some contributions are more closely connected than others. For instance, one thread might consist of several contributions rebutting one assertion, while another thread might offer support for an altogether different assertion. Sometimes individual threads get fragmented, or tangled, because of the uncoordinated order of arrival in the queue. This thread tangling can lead to feelings of frustration, for several reasons. "Plopping" is the systematic but polite ignoring of the contributions of one or more individuals. Their contributions, whatever they are, go "plop." Consequently, the people who are ignored can feel so alienated and bitter that they cease contributing. Pseudo-plopping is what happens when a discussion's threads become so tangled that contributions seem to be ignored because they are forgotten or mislaid in the mess. The result is frustration, and possibly some of the same feelings as occur in plopping. wanted to sayseven plus or minus two. Under stress, when angry, or amid interruptions or distractions, the limit is probably lower. Trouble occurs when the limit is less than the number of contributions intervening between the time when a participant first enters the queue and when that participant finally speaks. People lose track of the conversation, or forget some of what they wanted to say. Some feel frustrated; some feel inadequate. They experience stress. When three or more threads are active, the difficulty of keeping them all in focus overwhelms most people. Some have the experience of wanting to contribute to more than one thread. When people who want to make multiple contributions to different threads finally do speak, they have to flip from one thread to the next. Sometimes, things get so confusing that they have to use notes. They forget some of what they wanted to say, they misspeak, or worse. Discourse quality degrades. Would you like to see your comments posted here? rbrenZjEDJOJtZzedrwUAner@ChacPDgwmNwDWnUiHRBVoCanyon.comSend me your comments by email, or by Web form. See also Personal, Team, and Organizational Effectiveness, Effective Meetings and Conflict Management for more related articles. I offer email and telephone coaching at both corporate and individual rates. Contact Rick for details at rbrenaxFAfKUgIBDpYYJAner@ChacUPCqYMOxUNflDIvVoCanyon.com or (650) 787-6475, or toll-free in the continental US at (866) 378-5470.